After holing out a 10-foot putt at the 17th green, Pratima Sherpa hoisted her clubs over her shoulder and proceeded to the 18th tee at the Santa Barbara Golf Club. She was the only member of the Santa Barbara City College women’s team to play every hole of last week’s practice round. She also is the only Vaquero player who will compete against professionals next week. “At first I was excited, then, ‘Oh my gosh,’” Sherpa said about receiving an invitation to play in the IOA Championship at the Morongo Golf Club Tukwet Canyon course March 29-31. It is the third event of the 2019 Symetra Tour, previously known as the LPGA Futures Tour. The 19-year-old native of Nepal is rather famous herself. A Mountain to Climb, a 2018 documentary produced by ESPN, tells Pratima’s story: How she lives with her parents in the confines of a maintenance shed near the third hole of the Royal Nepal Golf Club, where monkeys roam the fairways and only the country’s elite get to play (unless you’re a girl who lives on the course); how her father, Pashang Sherpa, fashioned her first golf club out of a tree branch; how she played with a mixed assortment of clubs at age 11 and started winning junior tournaments; how an American journalist discovered her and started a GoFundMe page, enabling her to spend six weeks in California in 2017; how she competed with 21 men in a brave attempt to earn Nepalese professional golf status, bestowed only to the top five players (she finished ninth). It’s one thing to rub shoulders with the likes of Wie and Woods, and it’s another to play golf at a professional level. 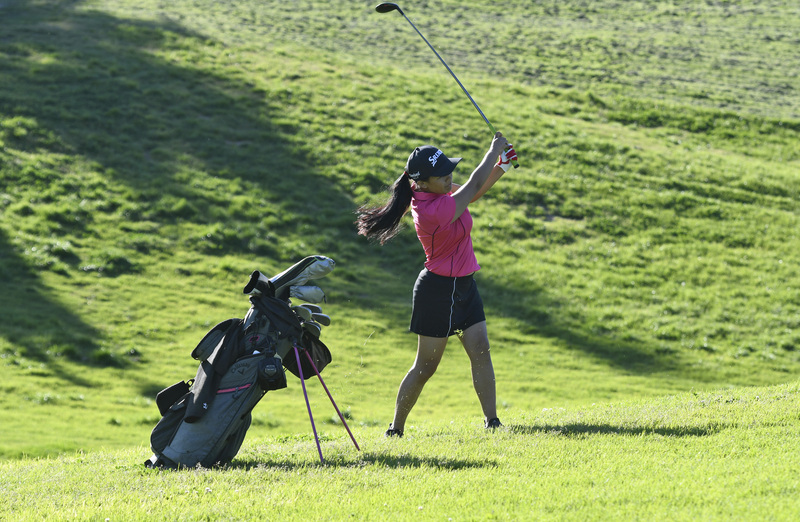 Pratima aspires to become the first female pro golfer from Nepal, and the next step in her journey will be playing at the community college level in the fall. She enrolled at SBCC in January after taking another 7,850-mile flight from Kathmandu. She is staying in Ventura with the family of Sophia Montano, who also were her hosts in 2017, and at a home in Santa Barbara when she’s taking classes. Montano, a Pitzer college student and also a golfer, befriended Pratima while on a research project in Nepal. Photo: Courtesy Pratima Sherpa was a long way from Nepal when she took a selfie with Tiger Woods a year ago. Last week, she was practicing at the Santa Barbara Golf Club for the fall season on the SBCC women’s team. Santa Barbara golf instructor Don Parsons has been working with Pratima. “She absolutely loves the game,” he said. “The joy on her face when she hits a good one — it’s infectious.” But he threw in words of caution. Pratima finished her round in solitude. The best thing about living in a shed at the Royal Nepal, she said, is the peacefulness of the golf course not far from the teeming streets of Kathmandu. “When I’m on a golf course, I feel like this is my home,” she said. Pratima Sherpa has seemingly done the impossible already, but the work goes on to take her journey even further. MARCH MADNESS: UC Irvine was head and shoulders above everybody else at the Big West men’s basketball tournament. In the final, the Anteaters blew out Cal State Fullerton — which had ousted UCSB in the semis — by 28 points. They take a 16-game winning streak into the NCAA tournament, where they are seeded 13th in the South Region. I see them upsetting No. 4 seed Kansas State on Friday and also defeating Oregon or Wisconsin to reach the Sweet Sixteen. Another dangerous 13th seed is Northeastern, the Colonial Athletic Association champion, matched up against Kansas on Thursday. The Huskies are known to rain three-pointers with a balanced lineup that includes 6′6″ junior Bolden Brace, who provided many thrills when he played at Santa Barbara High. Brace averages 10 points a game and is the team’s leading rebounder. HE’S SPECIAL: The booming Special Olympics basketball tournament that was staged for the 17th year at UCSB last Sunday is now known as the Gary CunninghamBasketball Competition. Cunningham, a former player and coach at UCLA, was UCSB athletics director for a dozen years and has continued to be involved in the community.